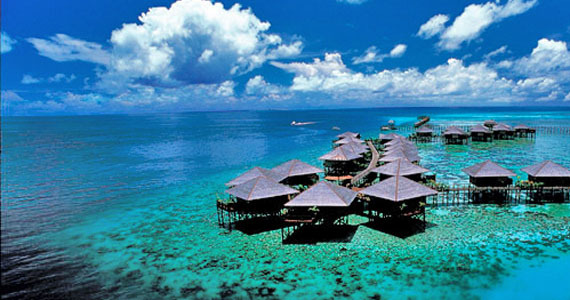 Sipadan is a very small island not far from the town of Semporna on the East coast of Sabah. Sipadan is an oceanic island and was formed by living corals growing on top of an extinct undersea volcano which rises 600m from the seabed. The boat ride from Semporna takes around an hour. Like many tropical islands, it is thicky forested and surrounded by sandy beaches. The geographic position of Sipadan puts it in the center of the richest marine habitat in the world and the heart of the Indo-Pacific basin. More that 3000 species of fish and hundreds of coral species have been classified in this richest of ecosystems. mantas, eagle rays, scalloped hammerhead sharks and whale sharks, each dive at Sipadan is a highly anticipated event. eels, leaf scorpionfish, amntis shrimp, fire gobies and various pipefish are guaranteed at various dive sites. The diversity and abundance of marine life found at Sipadan gives it the reputation of being one of the ten best dive locations in the world. The number of guests on this island has been restricted to protect its reef and marine life. Dive sites found here are Barracuda Point, Drop Off Point, Mid Reef, Staghorn Crest, Whitetip Avenue, Coral Garden, Hanging Garden, South Point and Turtle Cavern. No littering of any kind is tolerated. Do not collect shells, corals or other marine organisms. Take care not to break or damage corals or other marine organisms. Fishing is not permitted anywhere on Sipadan. Airport from the LCC ( Low Cost Carrier ) Terminal, Sepang. Booking may be made through www.airasia.com or walking into AirAsia’s sales offices which are located at KL Sentral and Airport. Alternatively, you are welcome to contact the Nationwide Call Centre at 1300-88-99-33 ( within Malaysia ) or ( +6 ) 03-78849000 ( outside Malaysia ). From KK to Tawau, you are advised to book yourself on any of the following domestic Malaysia Airlines or Air Asia flights again. Then take a 2 hour ride to Sempona, and Sipadan Island is located just off the coast of Sempona, approximately 45 minutes from the mainland. Alternatively, if you are affordable, you may fly to Sipadan directly from Tawau in a helicopter and save at least 6 hours of round- trip travel.